Boots and BriarsWelcome to Boots and Briars! The LessMess water tube can freeze and thaw without causing any damage. That works fine for us in the southeast, but if you live farther north freezing may be more of a problem. Mr. Kauder is a customer who lives in Virginia. 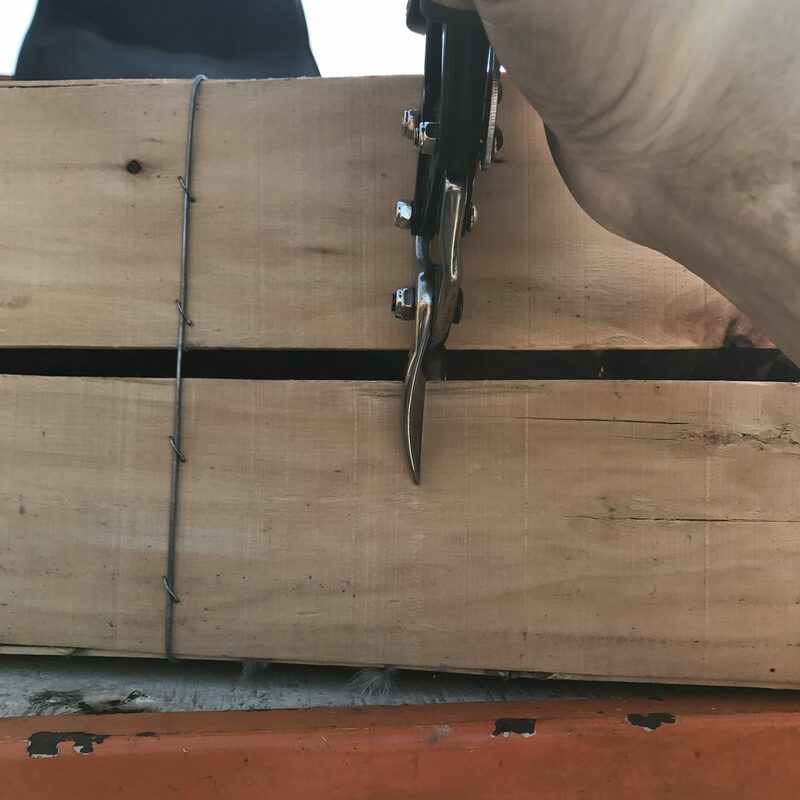 He sent us a video of how he solved this problem using a solar panel to power a heat tape. Over the years I have had many people ask me how long the feed will last in a Covey Coop, and how often should they check them. Of course, the answer will vary depending on how many quail are using the feeder and what season of the year it is. Generally,I check them every 3-4 weeks to see how fast the feed is going down. To shed some light on this, let me share the results of a little test I conducted several years ago. and leave them in the flight pen, so I could conduct a small experiment. I removed all the commercial feed from the facility and left one Covey Coop in the flight pen. 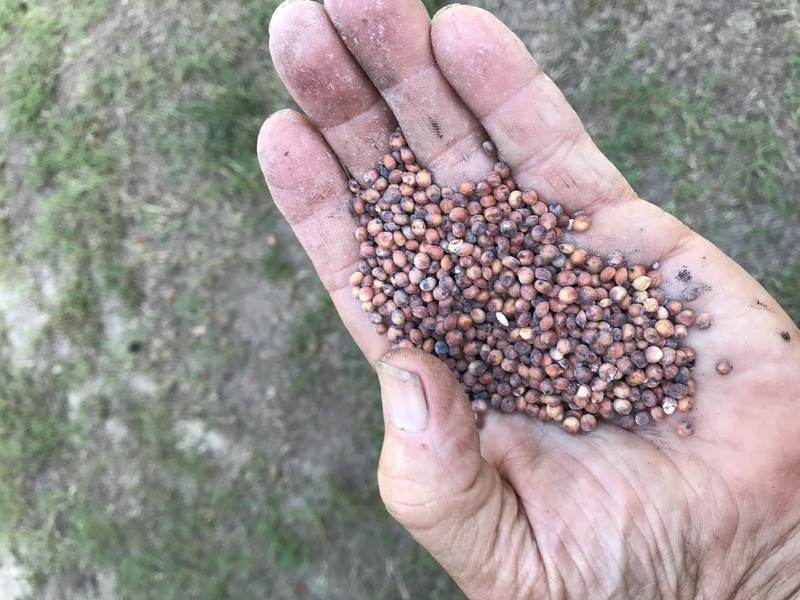 I filled the Coop Feeder with grain sorghum (about 25 pounds) and began to track how much the feed level changed each week. 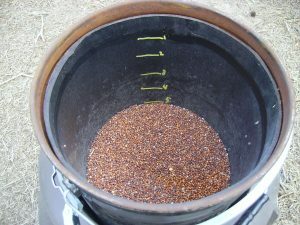 Once the feeder was filled, I moistened my finger and went around the edge of the feed level to mark the starting point. (Because the lid seals everything up, the mark will remain until I fill it with grain again.) As you can see from the picture, after one week, the 25 quail just created a slight depression in the middle of the feeder. 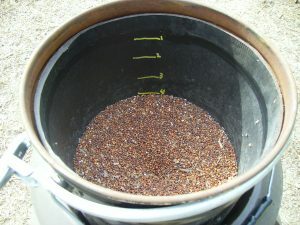 The remaining photos show the amount of feed the quail used during each of the following weeks. You can see that even after six weeks, these twenty-five quail still had enough feed for one more week. This test was conducted during the cooler fall months of the year. It is important to remember that the colder the temperatures , the greater the demand is for feed. Unlike this test where the quail were confined, free ranging quail will also be feeding on any natural food sources that you have provided on your hunting area. Helpful Hint 1 : Again,I generally check my feeders every three to four weeks after my initial quail release. 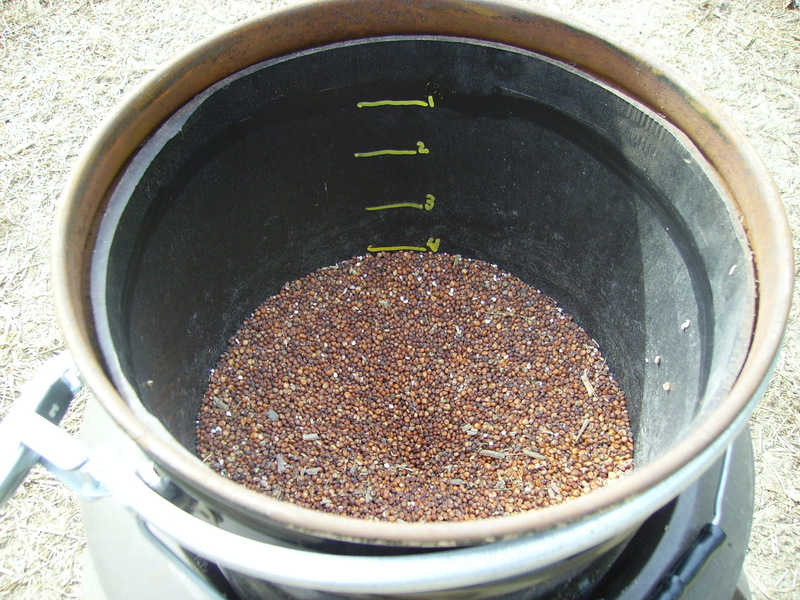 After removing the feeder lid, I mark the liner at the top of the feed level (as I did in the flight pen test). When I inspect the feeder on my next visit, I can see how much lower the feed level is since my prior check. This simple practice allows me to see which feeders are getting the most use and also helps me figure out how often I will need to top out my feeder. Helpful Hint 2: When servicing a feeder that is getting low on feed, I like to go ahead and dump the remaining feed in the coop lid and clean out any trash from the feed liner that has accumulated in the bottom. Then refill the feeder and scatter the feed in the lid in cover areas adjacent to the feeder. Sometimes the sorghum that I am using is very pretty clean and this is not as much of an issue. But if your feed has a lot of stalk pieces and trash, you will find this practice helpful. Quail will ebb and flow from the feeders as changes take place. I have seen coveys become pretty much independent of the feeders in early fall, only to return to heavier use in late winter. QUAIL HABITAT MANAGEMENT is a recently released book by Dr. Ron Haaland. Ron is no novice in the world of quail management. In 1977 he was working with Mr. John Olin of Winchester Arms and his staff at the Nilo Plantation. Ron’s work experience since that time includes the successful development of dozens of quail plantations from Georgia to California and down into Mexico. 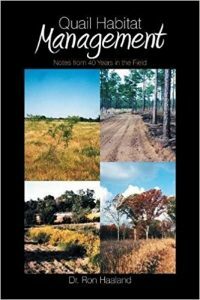 With over 50 years of field management experience placed between its front and back cover, this is a great PRACTICAL resource for anybody wanting to manage “quail land”. This book is available at Amazon. I would encourage you to check it out. The following article is a series of questions and answers I posed to I.B. Parnell, wildlife biologist with the Georgia Department of Natural Resources. He has directed and coordinated wildlife management operations on Di-Lane WMA since 2005. 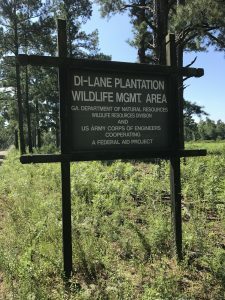 Tell us about Di-Lane Plantation. Di-Lane is located in Burke County, Georgia about 30 miles south of Augusta. It is 8,100 acres owned by the Army Corps of Engineers and managed by the Wildlife Resource Division of GA DNR. Among the management goals are to produce a robust bobwhite quail population and provide quality hunting experiences for bobwhite quail and many other game species. Years ago, I used to help your people with the annual fall quail census on Di-Lane. Back then we observed the habitat improving each year, yet the quail population seemed to remain stagnate. Is this why you began to consider predator control and supplemental feeding? 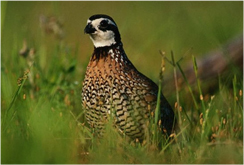 Bobwhite quail management begins and ends with habitat management. 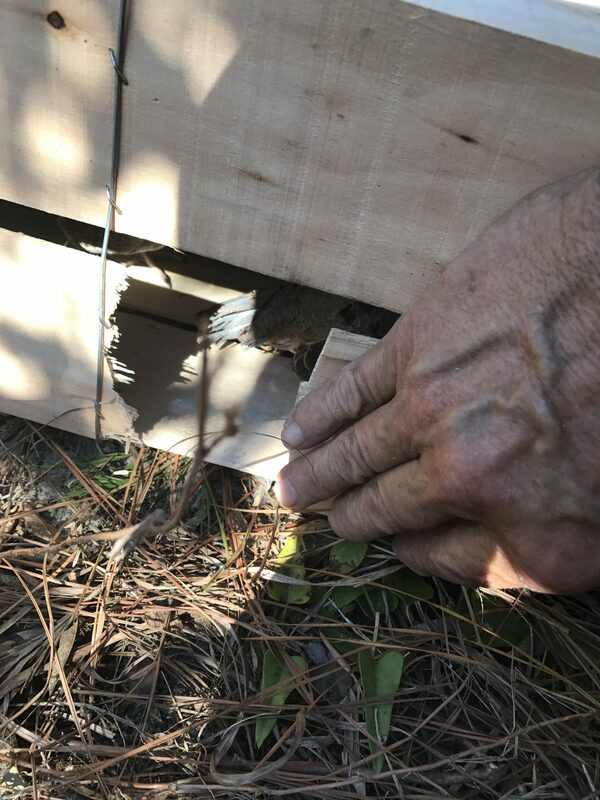 By the year 2000 the quail population on Di-Lane had dwindled significantly-as has been the case on many properties throughout the southeastern U.S.- because of poor habitat conditions. As a result of this decline, the Georgia WRD initiated a property-wide habitat renovation project in 2001 to include thinning of closed canopy planted pines, thinning of mixed pine-hardwood upland stands, and removal of natural pine dispersal that had encroached into fallow field habitat.Through this habitat renovation project, quality quail habitat increased from 3,400 acres to 5,400 acres. Based on quail hunter success as measured in numbers of coveys found per hour of hunting,the results from this large scale habitat improvement were roughly a doubling of the quail population.Even with this increase in quail population, hunter success was still relatively low (1 covey found per 5 hours hunted 2002-2007). Using the fall covey count survey technique that you mentioned, we were able to determine the quail population at Di-Lane was 1 quail/ 4 acres. At this point in the management program we were managing habitat and harvest mortality (via a quota hunting system). From 2006-2009 we saw only minor changes in the population density. the quail population at Di-Lane following a drought in summer 2007. Supplemental feeding appears to decrease the severity of these declines during drought periods. We conducted predator scent station surveys to determine what our predator index was on Di-Lane. 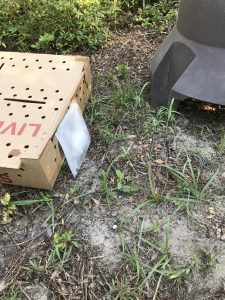 The surveys showed we had a high predator index on the property, and verified that predator management would likely improve our quail population. Why did you decide to use Covey Coops on the area and how many years have they been in use? There are two main methods of delivering supplemental feed to quail: stationary feeders and broadcast spreading. As mentioned previously, Di-Lane is a multi-use WMA, which means that quail management is not the only thing going on. While it is legal to provide supplemental feed and hunt quail around it, it is not legal to do so with wild turkeys. 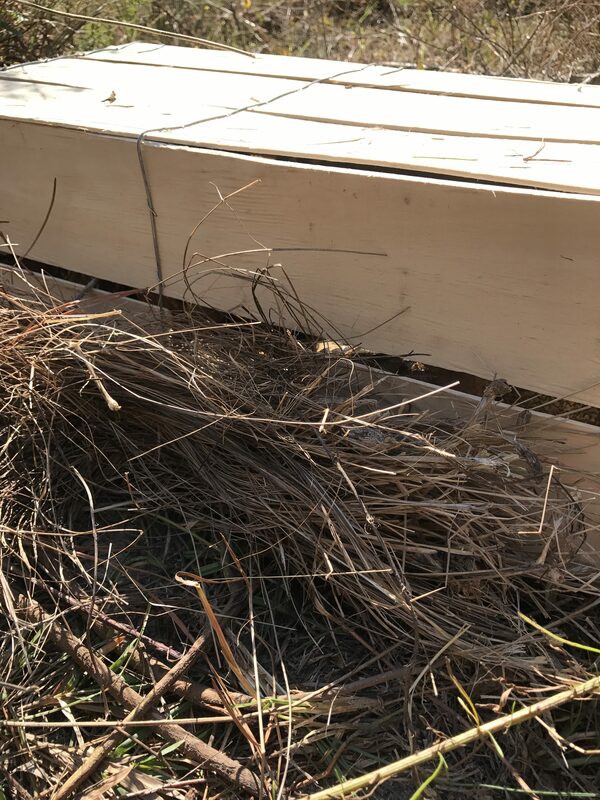 In addition quail hen body condition prior to nesting season is an important factor in nest initiation and egg laying, so providing hens with supplemental feed in late winter/early spring can influence their productivity throughout the breeding season. We had to find a way to provide the supplemental feed to the quail, but make it unavailable to deer and turkeys. Covey Coops provided us with the delivery system to accomplish both of these objectives and have been in use since fall 2008. 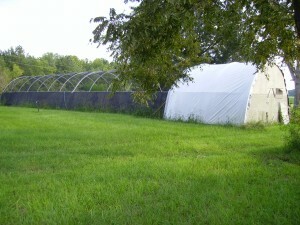 What steps were taken to allow the wild quail population to adapt to the feeders? 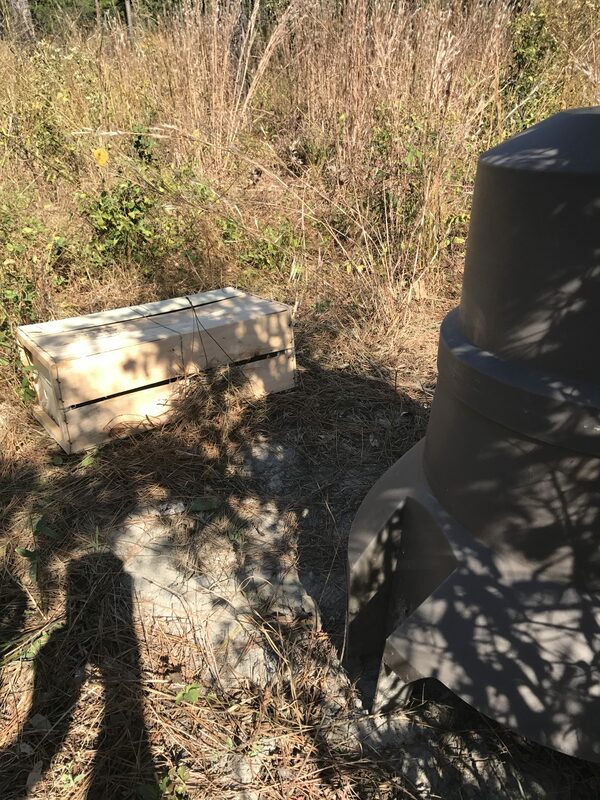 When we first installed the Covey Coop feeders, we put them in four different cover types(plum, bicolor, brier thickets, and brushy vine-covered edges) and monitored the quail usage with trail cameras. 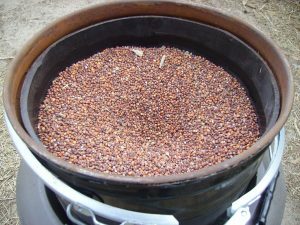 We also scattered grain sorghum into a 30-foot area around each feeder when we filled it. 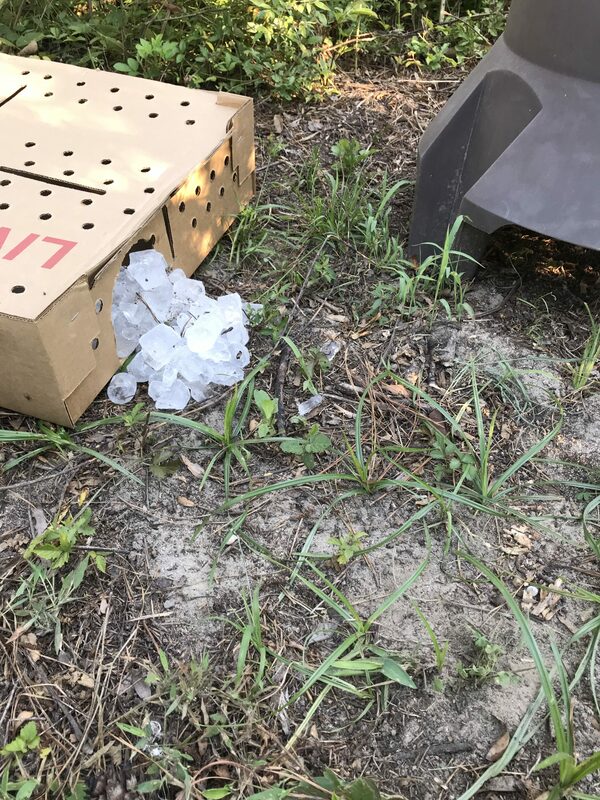 The wild quail did not quickly acclimate to using the feeders. 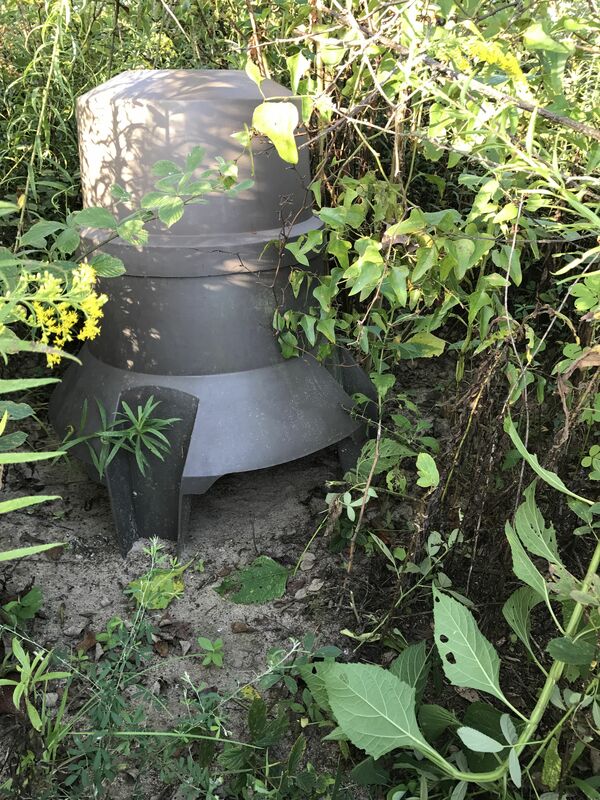 We suspected that the lack of visibility due to the low “skirt” on the feeder might be hindering the wild quail use of the feeders. In response, we modified the feeders by removing some of the “skirt” and increased visibility below and through the feeder. 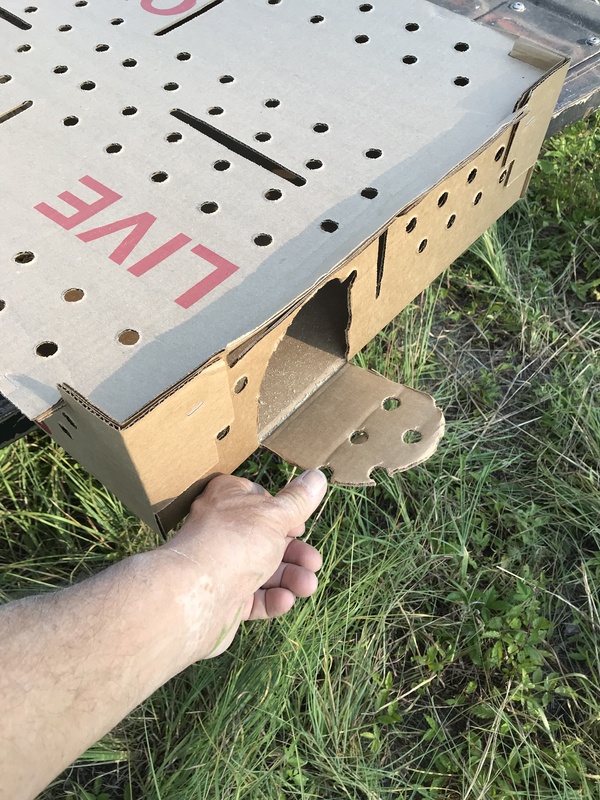 Whether it was this modification or just quail finally finding them we cannot say, but eventually quail began using a higher percentage of the feeders. 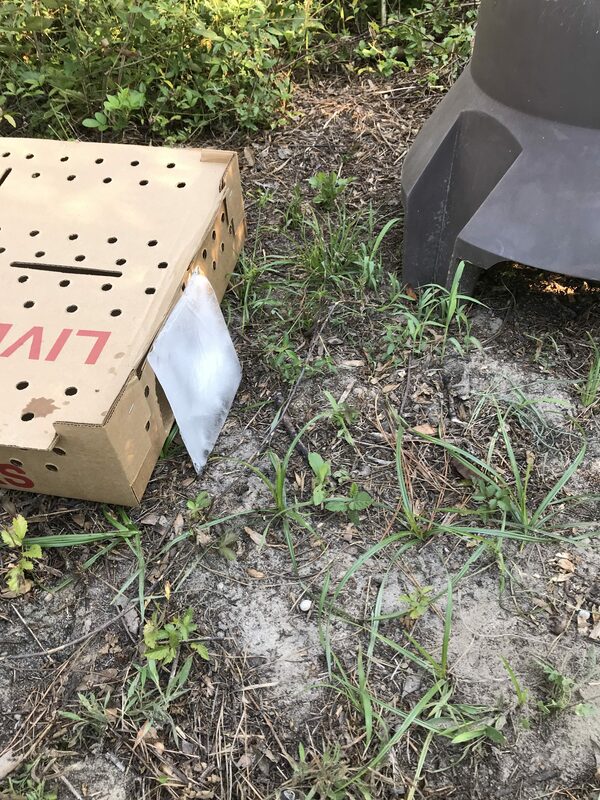 The camera showed that quail were using the feeders placed in plum and bicolor thickets, but not in those brier thickets or along brushy edges, so we moved all feeders into plum and bicolor thickets. The percentage of feeders used by the quail increased steadily each year. In 2011-2013 we had a dramatic increase in the feral hog population on Di-Lane. The hogs learned that they could flip over the feeders and roll them to get the grain sorghum out. Within days of filling the feeders, the hogs would have them emptied. To exclude the hogs from the feeders, we placed two T-posts with a circular portion of cattle panel wired to the posts around each Covey Coop. Since fencing the feeders, we have no further hog problems with them. 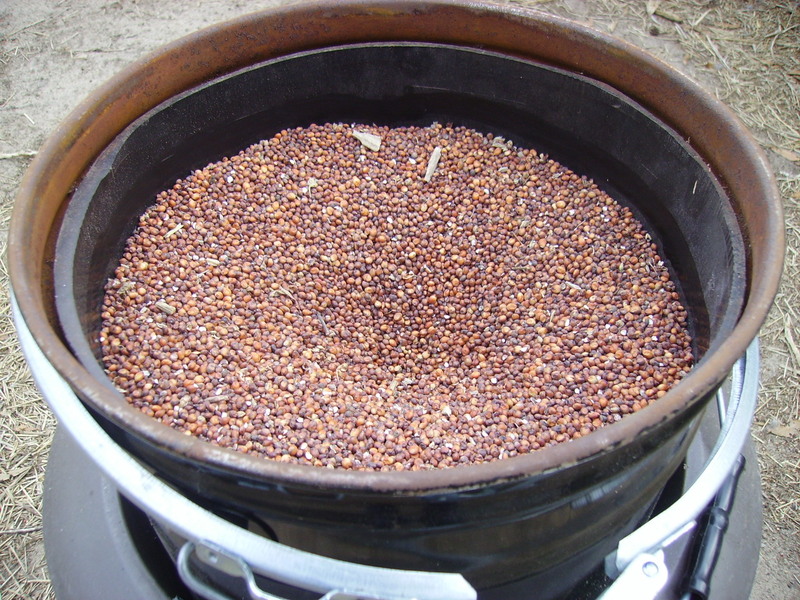 How did you determine when the quail were successfully using the Covey Coops? so if we found grain sorghum in quail crops, then it had to come from the feeders. Ultimately, we want the supplemental feed to be available if the quail needed it. 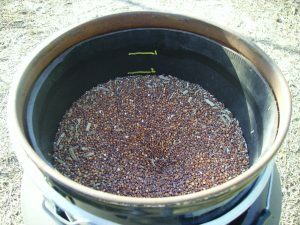 How are the feeders managed going into the spring and summer season? 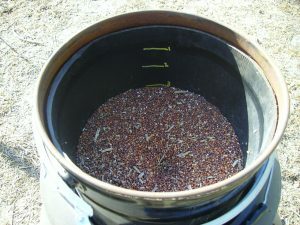 Feeders are generally filled four times a year-approximate time periods are March, May, September, and December. We also have to manage trees that invade the thickets with herbicide. In your opinion how has the feeding and predator management helped the quail population at Di-Lane? As we discussed earlier, quail management begins and ends with habitat management. Without habitat, you can provide all the food in the world and remove all the predators and see no substantial increase in the quail population. I can not directly attribute our quail population increase to either supplemental feeding or predator management. However, I feel comfortable saying that the combination of supplemental feeding and predator management, along with maintaining high quality habitat, has been responsible for increasing our quail population from 1 quail/4 acres to 1 quail/2 acres. 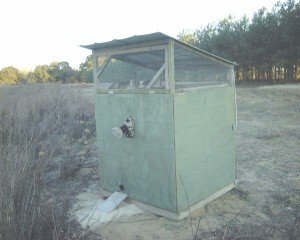 Every year about this time someone calls to find out if we have any plans for building a holding pen for quail. Some of these people want to have birds available to them for release several times during the year. Often, the bird grower is a good distance away, and making multiple trips to get birds becomes too expensive. Also, birds are exposed to stress when they are hauled a long distance. A large holding pen lets them recover before being released. Unfortunately, we don’t have any printed plans to make one, but we can tell you what Jim did that has worked well for us. Jim also made the pictures, so he is in very few of them. Back in 2003 Jim did an internet search and telephoned Atlas Greenhouse Systems, Inc .in Alapaha, Georgia, to order a 20’x84′, 6′ spacing Cold frame. He decided on this“hoop” shape since it was cheaper than using lumber to build a traditional box shape. Also, the curve allows the pen to shed snow and ice rather than collapsing under the extra weight. When I was a youngster staying on Uncle Jim’s rural farm in Virginia, the Johnny House was a place you ran to answer the call of nature. Back then we rated them as One Holers or Two Holers. If you train your own bird dogs you are probably familiar with a different type of Johnny House, often referred to as a Recall Pen. The most common structures used are about four feet square and about six to eight feet tall. (Of course, in Texas they are twice this size.) The house has a screened in top area and ledges for the quail to fly up and sit on. Part of this screen area contains a door that can be lowered in order to let some or all of the birds out. The floor can be either solid plywood or hardware cloth. (I prefer a solid floor. Well talk about this later.) There is also a one way catch funnel located in the bottom of the house. 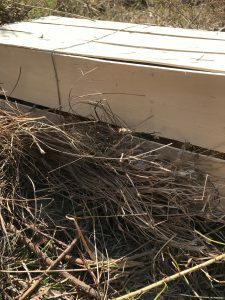 This allows the quail to reenter the house but not leave again. This 980 acres will make a great hunting area. Over 400 acres of mature pines, the rest in younger trees. Abundant deer, quail, and turkey! 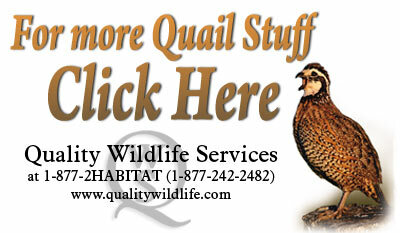 Are you scanning the classified ads and touring the countryside, in search of a piece of property to manage for quail? If the answer is yes, then maybe you need to be thinking about what characteristics would make you want to purchase a particular tract of land and what would cause you to pass on it. To help you with this process, lets discuss some various scenarios you are likely to run across. I was recently visiting a friend of mine named Harold Ray. He is known through out the field trial world as one of the best ever shooting dog trainers. He has won eighty championships and was elected to the Field Trial Hall Of Fame in 2007. Early in his career Harold was hired by Elvin and Inez Smith to be the trainer for Smiths English Setters. Last year Mrs. Smith passed away, and Harold was asked to go through some of the records and materials she had accumulated. During this process he came across a binder of very old issues of American Field magazine. Harold told me that one of them contained an article that discussed the red quail of the Ames plantation. At this point my ears perked up. Johnny Houses for Quail II video is a great resource for those wanting to learn more about the use of Johnny Houses on their properties. This DVD produced by Daybreak Productions for Quality Wildlife covers the basics, the season of usage, field placement, preparing the house, Stocking the house, Usage, Maintenance, Disinfection and End of Season cleanup. 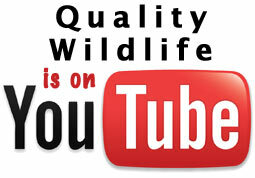 Not only is this video informative; but Wildlife Biologist Jim Evans makes it really fun to watch!